AEON Corporation is a private company with a proven track record of providing high-quality English educational services for students of all ages. Students who come to AEON are paying to study English with us in order to reach their English goals. AEON schools strive to maintain a high standard of educational quality and a sound business plan. Our teachers’ support and cooperation are essential to our success in both of these areas. At AEON, teachers take an active role both inside and outside of the classroom to make their school financially successful. Planning, preparing for, and teaching lessons are a large part of how AEON teachers support their schools. The following are other important ways AEON teachers contribute at their schools. AEON encourages teachers to build friendships with their students. These friendships begin in the lobby of the school. Students arrive ten to fifteen minutes before their lesson. Between lessons teachers and students have the opportunity to make connections outside of the classroom. This is the perfect place for students to practice their English without any structured lesson and for teachers to help students express themselves in a variety of topics. The lobby is the place where cultural exchange between teacher and student occurs. The lobby is a lively place and is great for advertising to passersby. Throughout their time at AEON, students are mentored by their teachers through the counseling system. Counselings are 1-on-1 sessions during which teachers may discuss student’s progress and goals, give additional tips and guidance on studying, or recommend future courses or materials. Students will have several counseling appointments throughout the year, with each appointment lasting around 5-10 minutes. Counselings are usually scheduled one week in advance and put on the teacher’s schedule. During counselings, teachers will learn more about their students and give them academic advice and make recommendations to support them in their studies. The goal is to motivate students and ensure that they will be successful. Self-Study courses are 3-month supplementary courses which students purchase to work on improving specific English skills. Many of the courses have students study at home and take check tests at the school with their teacher, while other courses will be conducted entirely at the school. Teachers will promote and sell Self-Study courses to their students by recommending a course that will help them improve their English. When students sign up for a Self-Study course, teachers provide encouragement and guidance to help them complete the course within 3 months. Before signing up for lessons at AEON, prospective students are offered an interview with an AEON teacher. During these interviews, the teacher will spend time talking with the student to assess their approximate level and then give a short demo lesson, with the goal of teaching them something using the AEON method. Through this interview, the teacher will show the quality of AEON and our lessons and ultimately motivate these students to enroll at our schools. Each branch school has a weekly business and teachers meeting. In business meetings, the Manager will go over the school’s financial goals and business strategies. Teachers contribute to these meetings by sharing information about their current students and learning about what they will be doing to support their school. Business meetings are often conducted in Japanese, with a teacher or staff member translating. In teachers meetings, teachers will have the opportunity to work on improving their teaching skills for both adults and kids lessons. Teachers will be able to learn new teaching techniques and share information with their fellow teachers. Everyone at the school will work together to keep their school looking clean and organized to provide a comfortable learning environment for the students and themselves. Teachers will also help create displays for the school lobby and classrooms to promote different events or activities at the school and create a positive working environment. AEON schools are responsible for advertising in the area around the school. Teachers support their school’s advertising through activities such as helping with the production and distribution of flyers and by being featured on the school’s website. The Student Management System is a computer system for teachers to keep records of their students’ studies and progress. Teachers will update student records by entering information about lessons and counseling. Some students take lessons with several teachers over time, so this is a way teachers can learn about students they will be teaching in the future. Teachers are also responsible for keeping track of students’ attendance. After Kids lessons, teachers do a quick (2-3 minute) review with parents to show what the students learned in class. These reviews usually take place in the lobby and are conducted in English. After each lesson, teachers will give their students special stickers to mark their attendance and reward them for studying at home. To keep track of each child’s progress internally, AEON uses the Student Management System. Furthermore, teachers can send a message to the child’s parents several times a year which details how their child has improved. Schools hold speech recitals which give our children the opportunity to show off what they’ve learned. Teachers will coach their students to prepare for these events and give them awards for their accomplishments. AEON schools also hold seasonal events like Halloween parties to help our students experience and learn more about other cultures. Teachers will help plan and conduct these events which provide their students with wonderful experiences where they can use English. 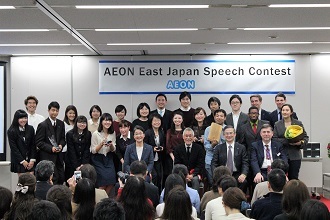 AEON conducts a number of promotional activities such as TOEIC high score contests, academic seminars, and word-of-mouth advertising campaigns that teachers will help promote by announcing them before or after class and speaking with students individually.